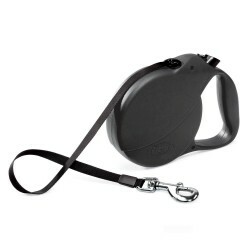 Product Details - Material - Durable chromed snap hook, Leash, Color- Black , Suitable- Large Breeds Dogs. Size-16 ft. Product Information - Flexi Standard Retractable Cord Leash offer superior control and security with a comfortable, convenient handle. These retractable leads feature instant braking, high strength cords, durable chromed snap hooks, and ergonomic handles to provide the ultimate walking experience for you and your dog. Short-stop braking system keeps pets secure. High strength cord with durable bite belt and reflective safety elements. Durable chromed snap hook attaches to all collars.